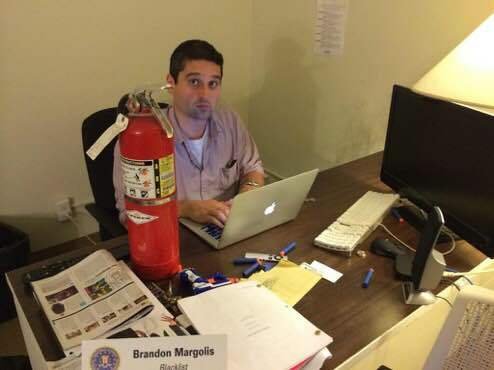 In today’s hot seat we have writer/producer Brandon Margolis; one half of the very successful duo known as The Brandon’s, (the other being Brandon Sonnier). In my interview with him, Brandon talks about his career path, gaining experience on other productions and the process followed when introducing an idea for a forthcoming episode. PC: Where about did you grow up? And did you have a typical upbringing? BM: I was born in New York City, but my family moved across the country twice when I was young. I lived in Seattle, Washington for two years, and then spent the rest of my school years in Greenwich, CT. Anyone fortunate enough to be raised in Greenwich would have an upbringing likely more comfortable than most people, but my experiences were otherwise fairly typical. School, sports, dating, college, etc. I’m very close with my family and miss them dearly as they still live on the east coast and I’m now in Los Angeles. PC: At what kind of age did you recognise the TV industry, as being something you would like to be involved with? BM: I have always been a huge fan of tv, and am old enough to remember the time before DVR where you had to be in front of the tv when your show aired, or you missed it. New episodes of The Simpsons and The X-Files were always a priority. But I never considered writing for television as a career until I was a sophomore in college and at a crossroads as far as what major to declare. My parents asked me to think long and hard about what I was most passionate about. Creative writing and watching movies/tv shows were basically all I could come up with. But screenwriting wasn’t ever something I had considered as a career. That was for people in Hollywood who wore cool glasses and had a portfolio. My parents really encouraged me, if screenwriting was truly what interested me, to pursue it. PC: What path did you follow to pursue that? BM: This is the broadest strokes version of that path: I was a sophomore at Boston University when I had my revelation about screenwriting, and decided to move closer to home. I transferred to Brooklyn College and was able to secure an internship at Miramax’s office in Tribeca. I was writing coverage for an executive who urged me to move to Los Angeles if I was serious about writing. LA is a much bigger pond in terms of jobs in entertainment. So, after graduating college I moved to LA. Now, I expected to take Hollywood by storm with my screenplay I wrote in college and I think anyone who moves to LA to break into the industry needs to have some sort of irrational confidence that they’re going to make it but the truth is that it took me ten years to actually get a job as a professional writer. In that time I got a job as an assistant at a talent management company, a personal assistant to a writer/director, and was even a private tutor for a time. All the while I was working on my own material and trying to get it in the hands of anyone who was willing to read it. PC: Are you a great reader? Can you share some of the books you have particularly enjoyed in the last couple of years? BM: I am a big fan of reading. As a teenager I was obsessed with Stephen King. I don’t have as much time to read these days, but I really enjoy detective stories. Some of my favourite franchises are Lee Child’s Jack Reacher series, Harlan Coben’s Myron Bolitar series, and Robert Crais’ Elvis Cole series. 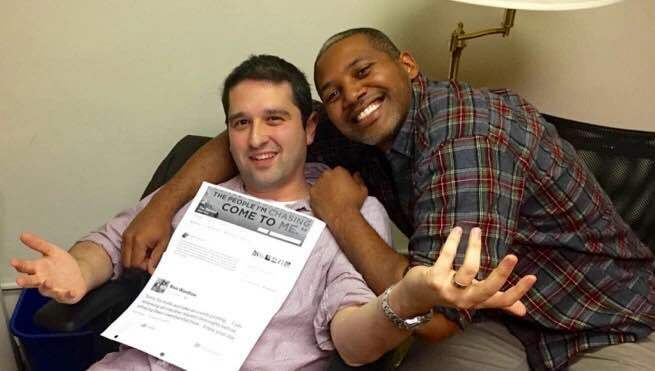 PC: During the course of research I read about a NBC Writers on the Verge program that you and Brandon Sonnier successfully managed to get a place on, can you tell us more about that? BM: Brandon Sonnier and I met when I first moved to Los Angeles. His wife worked at the same talent management company I did, and she was one of my first friends out here. Brandon had his own career going as an independent filmmaker and I really valued his opinion of my own work. It’s important for aspiring writers to have a circle of writer friends who they trust to give them an honest read. Brandon and I eventually realized how similar our tastes were and we decided to work together on an idea we had for a pilot. We had so much fun collaborating that we kept it going and worked on a number of samples that eventually secured us a manager. Our manager suggested we apply to NBC’s Writer’s on the Verge program, which is an open-submission contest for writers aspiring to write for television. Many of the networks and studios have similar programs, but we were fortunate enough to participate in NBC’s program. It’s a workshop over a few weeks where they really help the participants understand the level you need to write at to get staffed on a show. The most fortunate part of all was that we finished the program just as NBC was excited about a brand new drama series debuting that fall starring James Spader. While it’s far above my pay grade to say what determined us getting staffed on The Blacklist, coming off of NBC’s program was obviously a big help. PC: Do you write down and store many of your ideas however fleeting they might be? BM: Whenever I have an idea that I think could be a cool story/character/plot point/whatever, I usually email or text my writing partner, asking if the idea seems viable. Sometimes he likes it, sometimes it’s nonsense, but by emailing each other we always have the idea written down somewhere we can go back to as a reference. Like most writers, I’ve also had inspiration in the middle of the night that I made the mistake of assuming I’d remember in the morning. That never works. I either completely forget it or if I wrote it down, it makes no sense to me in the morning. PC: You worked as assistant to director on The Office: how did you secure that job? Was that before James Spader joined the cast? BM: I mentioned earlier that I worked as a personal assistant to a director. That director was Paul Feig (Ghostbusters). I was his assistant for a few years, and it was before his big feature break with Bridesmaids. At that time, Paul worked mostly in television and was building an impressive comedy resume working on shows like 30 Rock, The Office, and Nurse Jackie. It was such an exciting time in my life to get to travel with him to set and witness some of the best tv comedy getting made. Paul had a really great relationship with the writers and cast of The Office, and they brought him on as a co-executive producer for their fifth season. Paul’s job, when not directing, was to work with other directors to help maintain the look of the series. So we worked on set for the entire season, and I got to know some of the cast and crew pretty well. I even got to be in their fantasy football league! It was a little intimidating meeting the cast at first, but fantasy football helped break the ice. Rainn Wilson was always down to talk trades. Paul moved on to other projects after that season and only went back to direct the occasional, but important episode. Jim and Pam’s wedding and Steve Carell’s last episode for example. We were long gone by the time James showed up at Dunder Mifflin. PC: I have been reading about Huck & Finn are you able to talk about that? BM: I believe you mean Sawyer & Huck, which I’m more than happy to talk about! It was the first pilot sale Brandon and I made, back in 2015. We came up with a modern day take on the classic Mark Twain characters (which we were allowed to use because they are in the public domain).Sony was very excited about our idea and set up pitches at the big networks. CBS ended up buying our pitch and we got paid to write the script. Unfortunately, CBS decided not to shoot the pilot in the end, but we learned a ton about the development process along the way. Particularly how difficult it is to get a show made. PC: What was the process from application to being offered the job working on The Blacklist team? BM:I can only tell you about the process from our end, which was that we got an interview with John Eisendrath and John Fox (a producer who had been involved with the project since before the pilot was written). It is my belief that NBC put in a good word on our behalf after finishing their program which probably helped us get the meeting. It’s very hard to know what a showrunner is looking for coming into that meeting, so my advice to any young writer who is lucky enough to be considered for a position on a staff is to keep in mind that this person is deciding who he or she wants to spend hours upon hours in a room with. Be polite, be personable, be humble. PC: Were you already on board before casting? BM: No. The pilot episode had been written and shot long before Brandon and I joined the team. The network has to decide they want to order a show to series before any additional writers are hired, so everything was in place already. PC: On The Blacklist you are credited as staff writer on the pilot episode, that quickly changed to story editor by episode 6 and then to executive story editor in 2015. Can you provide the low down as to what each of these job titles entails? BM: I’m assuming you’re seeing these credits on IMDB.com, which is sometimes unreliable. The only writer who should ever be credited on the pilot is Jon Bokenkamp. Brandon and I were hired as staff writers for season one, so technically we were the staff writer on every single episode of the first season, even though we didn’t join the show until after the pilot was already finished. When we were brought back for season two, we were promoted to Story Editors. In season three, we were Executive Story Editors. And for season four, we got a new contact and made the jump to Producers. The easiest way I can explain the differences in job titles is to think of military rankings. The lowest rank is a Staff Writer. The highest rank is an Executive Producer. If you’re fortunate enough to be asked back to a future season, depending on your contract, you can earn a title bump. Brandon and I work very hard, but there’s no denying how lucky we were to get hired on a show that was popular enough to be brought back for a fourth season. Every time a show gets cancelled, there are staff writers who might’ve just got their first professional job that they waited years for, and suddenly they’re back at square one. PC: Almost every episode brings with it a storm in a teacup: the fans can be up in arms one week, only for it all to make sense the following week and the disillusioned breathe a sigh of relief. How do the writers, story editors and show runners deflect any criticism poured over the show? BM: The truth is that while we hope people enjoy every episode, we know it’s impossible to please everyone all the time. And there’s not much that can be done in the immediate aftermath of an episode anyway. 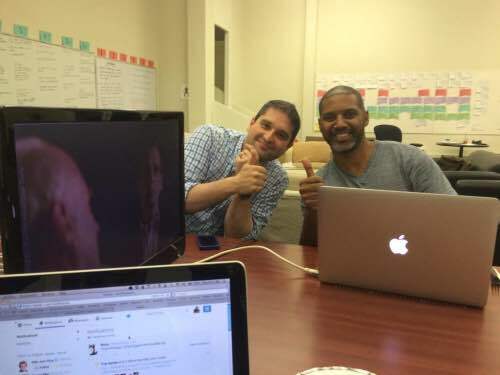 By the time the audience saw the season premiere of season 4, the writers were figuring out episode 410. All we can do is try to write the best and most interesting stories possible. PC: Personally, I love the fact that the writers’ room and most of the cast actively engage with fans on Twitter, is this something that is very much encouraged? BM: We love live-tweeting with fans! Not all of our writers are Twitter savvy, but those that participate love staying late Thursdays to engage the audience. The room orders dinner and it’s a fun viewing party. PC: You seem to be a pretty close bunch, who are the jokers or pranksters? Who is more likely to say “right let’s get back to work” people? BM: The people who have been on the show the longest usually feel the most comfortable cracking jokes. I like to think of myself as a bit of a jokester but you’d have to ask someone else if I’m actually funny or not. I might just be amusing myself. And I think everyone has a pretty good sense of when it’s time to buckle down. Joke around too much and people stop taking you seriously. PC: You couldn’t have possibly imagined that James Spader would bring such a force of character in Raymond Reddington in the way that he has, do you agree? BM: I was aware of The Blacklist as an NBC project before he had been cast. I got to read the script and knew right away it was going to be a show I would love to watch. The first 5 pages of the script had me hooked. But when I heard James Spader had been cast, I knew the show was going to be a hit. I couldn’t predict how James was going to elevate the character, or what creative choices he would make, but I knew he was bringing a major league talent to a wonderfully written character. It was going to be undeniable. PC: Megan Boone and James have wonderful chemistry, is this part of the reason the show has been so successful? BM: Absolutely. The show always comes back to Red and Liz. PC: How does the writers’ room keep a consistency in characterisation and tone for individual characters? BM: It’s important for a writer to understand the characters’ points of view when it comes to pitching stories and writing scenes. We like to try and take characters in interesting directions, but the choices they make and things they say/do always have to feel true to who the characters are. So, if an idea is pitched that feels wrong for one of the characters, somebody in the room will usually point it out. Then we can discuss how to tweak the idea to make it feel more in line with whom the character is and what they’re going through at the time. PC: How does everyone keep track of the various plots? Does one person take charge of say the continuity of how Aram would typically explain a high-tech solution to a problem? BM: The writers all work on this together. In addition to having a brilliant writer’s assistant, our room does a pretty good job of working through ideas that bump too close to things we’ve done before. Having been on the show since the beginning, Sonnier and I try to play the role of encyclopaedia when it comes to tracking stories. But at the end of the day, our head writers, Jon Bokenkamp and John Eisendrath, decide the ultimate direction to take the characters and the story. We do our best to help them avoid doubling up or contradicting previous storylines. PC: With the spin off, The Blacklist Redemption coming soon, will it be the same staff writers or will more be brought in? Will this give individuals more opportunities for writing their own episodes? BM: The spin off has a writers’ room of its own, but Bokenkamp, Eisendrath, Luke Reither, and J.R. Orci will be contributing to their story line. I look forward to seeing what direction that show takes. PC: Liz sometimes has a dog we know is called Hudson, we know Reddington has a cat, does it have a name? BM: Not to my knowledge. Any suggestions? PC: I think I know the story of the Spader Cup…I believe it started when James Spader was in London filming Ultron and he got involved in following the Football World Cup (soccer). When he returned to shoot The Blacklist, he organised a fantasy league for the cast and writers, with the engraved Spader Cup to be presented to the winner and them being allowed to keep it for a year… Is this correct? Who has won it thus far? BM: I hate to burst your bubble, but the true story is far less exciting. I’m the commissioner of the Writers’ Room fantasy football league (which has also included cast members and members of post-production). Since we weren’t really going to play for money or anything like that, I decided we needed a prize that would allow the winner to lord their success over everyone else. So I had a trophy made and we declared it the Spader Cup. Previous winners include John Eisendrath’s first assistant, Hisham Tawfiq (Dembe himself!) and Exec Producer Daniel Cerone (who holds the cup at the time of this interview). Season four of the league is underway and I’m hoping to secure the cup for myself this time! PC: Do you have a soft spot for a particular Blacklister? BM: Most of the characters are pretty creepy, but as a writer I’m most proud of T. Earl King. As I mentioned earlier, I grew up in Greenwich, CT which is a town that has more than its fair share of wealthy families. When Sonnier and I came up with the idea for this family that runs illicit auctions, I tried to imagine the twisted, Blacklist-y version of some of the Greenwich families I encountered growing up. I’m happy to say the Kings aren’t based on anyone in particular, just the idea of a family who had so much money and privilege they thought themselves to be untouchable by anyone. Including Red. Which was obviously a huge mistake on their part. PC: To what position would an executive story editor aspire to next, or is that top of that ladder? BM: The next spot up the chain from ESE is co-producer. The fun part about becoming a producer level writer is that your name appears at the top of the show’s credits, rather than the smaller text that flies by at the end. I’m proud to say Sonnier and I are producers for Season 4! PC: The Blacklist characters have their playlists on Spotify which, I have been told, are heavily influenced by the actors themselves; can the cast members and writers’ room lean on Jon Bokenkamp and Jon Eisendrath to place a specific song in an episode? What song would you choose? BM: Jon Bokenkamp in particular works closely with our music supervisor to pick the songs that appear in the show. Jon is always open to pitches, but I haven’t really been inspired to suggest a song. PC: Can you remember the first song that really got your attention? BM: Got my attention doesn’t mean it was good, right? I feel like most people discover “popular” music when they’re around 10 years old, and there’s always a batch of songs that you were obsessed with as a kid that when you look back you just have to shake your head. I was born in 1980, so you can only imagine how blown away I was the first time I heard “Ice, Ice, Baby”. PC: As a writer/story editor how important are the lyrics in a song to you? BM: Lyrics are obviously a very important element in song writing, but I have to admit whenever I’m singing along to something on the radio I’m probably singing the wrong words. PC: Assuming live music is something you enjoy, tell me the best concert you have been to? And the most recent? BM: Best concert was Bruce Springsteen at Giants Stadium during The Rising tour. He played a ten song encore. He’s The Boss for a reason. Most recent concert was part of a Comedy/Music show at The Largo in West Hollywood where I learned Basia Bulat existed. She’s got an amazing voice! BM: Not since the recorder in 1st grade. PC: Do you happily hit the dance floor or would you rather cut off your own arm? BM: I don’t mind dancing at weddings. That’s about it. PC: Songs often evoke special memories of a time or place; can you give me three examples of songs that take you back to a certain happy place? BM: I can’t name specific songs, but I love Sirius Radio and listening to the 90’s on 9. I can remember what grade I was in when songs came out and it reminds me of middle school, high school, etc. PC: Is there a decade that especially stands out to you, as having the best music? BM: I’m a big classic rock fan, so I would probably say the 70’s if I had to pick one decade. PC: Which movie soundtrack(s) are you a fan of? BM: Guardians Of The Galaxy is the most recent. Loved Pulp Fiction at the time. And there was a great mashup of hip hop and rock on the soundtrack to the movie Judgement Night. Another 90’s classic! PC: What is that one song, you must turn up and play at full volume? BM: Money For Nothing by Dire Straits. PC: I think the tracks used on The Blacklist are often outstanding and fit perfectly, tell me some that you have adored? BM: I loved When The Man Comes Around by Johnny Cash. Mostly because it set the tone for the first episode I ever wrote, THE GOOD SAMARITAN. PC: Is there a special poem or piece of music you would like played or read out at your funeral? BM: Anything but Another One Bites The Dust. PC: Are you a vinyl guy or more of a digital format type? BM: Definitely digital format. I love being able to skip tracks. PC: Which album would you play to soothe your tired, or stressed out, self? BM: Dave Matthews Band Live at Red Rocks. PC: Which singer or group would you describe yourself as being a super fan of? BM: Springsteen, Dave Matthews, and Aerosmith are the three bands I’ve seen the most in concert. PC: I’ve had some shameful answers to this final music question 😉 whose music is your guilty pleasure? BM: People tell me I should feel guilty but I don’t. I love Genesis and Phil Collins. So there! BM: My wife and I have no plans, so we spend the day inside, watching tv shows on the couch and ordering in. Probably taking a nap at some point. I’m sure this will change when we have children, but until then I’m going to enjoy being a lazy human being. PC: I cannot possibly live without? Thanks very much to Brandon for taking part, thanks to Davina Baynes for her assistance.